The Tribe and Tigers wrap up their early-season showdown today at noon at Progressive Field. I, for one, am loving this preponderance of weekday afternoon games this year. This is something like the seventh "businessman's special" (as they used to be called), and not much is better than passing a few hours of a workday listening to baseball. Unless, of course, it's playing hookie and having a couple beers and dogs down at the park. It's foolish to assign too much a value to a May series. 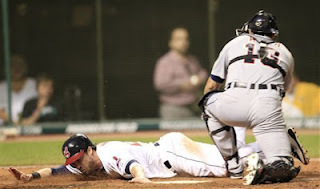 Especially when looking through the lens of 2011, where the Indians also stood in first place at this part of the season and beyond, with the Tigers in a similar six game deficit on May 24. Of course, the Indians faltered in the second half of the season, particularly in their 10-game losing streak to the kitties, and the rest, as they say is history. Ancient history, if you haven't noticed. And judging from the attendance you haven't. Chris Perez has gotten all the attention for his comments this week about the fan reaction (and lack thereof) to the team in general, and him in particular. Much has been written and said about Mr. Perez' comments, and what can I add? I'm sure the Indians brass and other players are secretly glad that someone did their dirty work--trying to light a fire underneath the supposed fanbase in Cleveland. No matter the facts about economics, salary caps, and blown saves, the Indians' attendance is embarrassing. Not just last place. Last place by a longshot. All I can guess is that if the Indians keep winning, the fans will show up. This team seems to have great chemistry, as shown in their early season dustups with opponents and how they have closed ranks around Perez. And the fans, who could have easily reacted frostily to Perez, instead welcomed him with standing ovations on Tuesday and Wednesday. This afternoon's game should be a doozy. Sure, the prospect of facing Justin Verlander will not give any team great confidence, but the fact it, this series is already won. Justin Masterson has scuffled a bit this year, but he can match up with the best of them if he is on his game. This could be a low scoring, run-manufacturing game. Which happens to be the Indians' specialty. The Tigers don't appear to be the juggernaut that they were billed as. The Indians have a good team, and win or lose today, it's been a good week overall for Indians baseball. Sunshine and baseball. What could be better?